I've been working two part-time jobs, neither of which have regular set hours. Add in all the midwife appointments (we've now entered the every two week phase of pregnancy). And then try to plan hikes around all this (I'm part of a national organization in which volunteers lead weekly walks for families with little ones). Good luck, I tell you. It's just too much to keep straight. I tried using an online calendar, but I need to see it all laid out in front of me. Plus, I'm still trying to come up with a system to ensure my bills get paid in plenty of time. I really wanted one of the fabulous life planners I'd read so much about by Erin Condren Design, but I didn't have $50 to spend on a planner. I did, however, receive an Amazon gift card as a Christmas present, so I spent many (many) hours perusing the options. I finally decided on one and, after one of the most discouraging deliveries on the planet, it eventually arrived. Side-note: Is this why people have Prime? So their packages don't drop off the grid and arrive 4 days later than expected? Anyway, moving on. Having only used the planner for a couple weeks, I've already realized that I would have preferred one with the days broken down by hours so I could block out whole chunks of time. Next year! Otherwise, I'm loving it. And it's one more item I can cross off my 2015 To-Do List. When you have a flex shift you have to call the store a couple hours ahead of time to see if you're needed. Today I was not (phew). It's cool that you make your own. I'm not that crafty. I've been struggling to find a good day planner option, too. 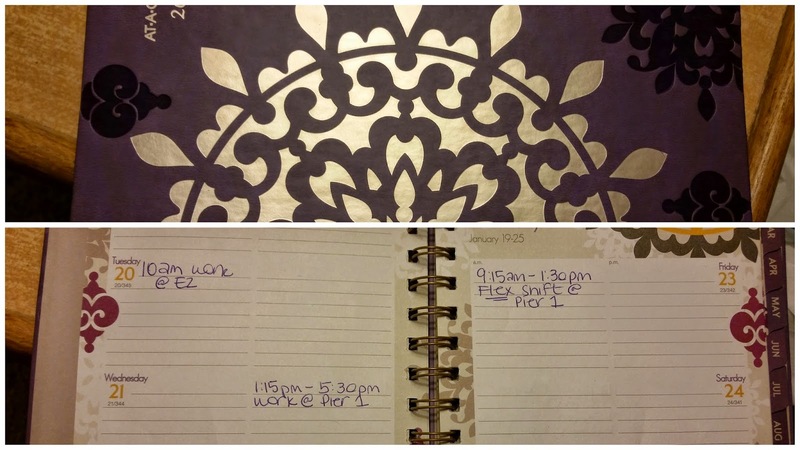 I used to use a Franklin Covey planner religiously, but then I changed jobs. My new workplace has a shared server calendar, so there wasn't a need to keep a paper calendar plus we got iPhones (with shared google calendars) at home, so I just quite using it. This past year I've taken on so many more responsibilities at work that I simply must get a good to-do list system going again. I'm trying a no-frills daily planner I got at the dollar store that has a whole week on each two-page spread, combined with some super simplified Bullet Journal tricks. We'll see how it goes! Also, can I just say that you're a super hero for leading hikes and working two jobs while a million years pregnant? Seriously. Super hero.